After more than 6 months planning, I finally made it to Hong Kong. Unlike my past holidays for almost the past 10 years where I normally went with friends or by myself, this one was really special because I went with my family plus R too <3. It started with a plan to take my mum and brother for a holiday. Then I decided to set Hong Kong as the destination because it’s not too far and (I thought) not too expensive, plus they have Disneyland which we haven’t been to. Lucky the universe seemed to conspire and last March I scored promotion tickets from Singapore Airlines from Jakarta to Hong Kong. Yay! And then when R finally decided to come to Jakarta this September, he managed to find a multi-city ticket with a good deal so he could stop by Hong Kong before reaching Jakarta. All seemed good, I was happy that he got to join our family holiday. So we left Jakarta to Hong Kong via Singapore on the 8th of September. Meanwhile, R left Los Angeles to Hong Kong. He arrived there earlier so he managed to check in to our hotel first, and later picked us up together with Indit, our friend who lives in HK at the airport when my family and I arrived. There was nothing much to do because we arrived quite late, so we only had dinner at Tsui Wah Restaurant then went straight to the hotel. We stayed at Cue Hotel Hong Kong which is located in Wan Chai area. I am very much satisfied with the hotel because it is easily reached, only a few minutes walking distance from Wan Chai MTR station. Too bad I forgot to take pictures of the room before we occupied it, so I just going to share a picture of our room which I found on the internet. But trust me, our room exactly looked like that when we first opened the door. Nice, isn’t it? The hotel was clean, staff was helpful, I loved the minimalist design and they also provide L’occitane toiletries in the dorm rooms (where R was staying). Can you imagine that? So fancy! One plus thing is that they provide family room for 3 adults which was perfect for me, my mum, and my brother. Very recommended hotel, I should say. On Friday we went to Disneyland!!! At first, I was so excited, I wanted to spend a full day there so I did not have other things to do in my itinerary. But then I realised that Disneyland Hong Kong, unlike the one in LA, opens rather late (to my standards) at 10:30 AM. So we started the day by having a cup of coffee to-go at Omotesando Koffee near our hotel. The latte was by far the best I’ve tasted! And I really love the fact that the barista asked me if I liked my latte to be nutty or fruity. No other baristas have asked me that kind of question before. 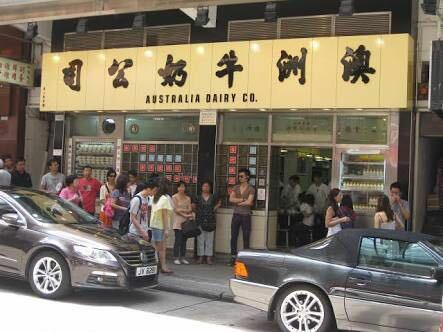 Then, we had breakfast at Australia Dairy Company near Jordan MTR station. Now this is funny. Unlike the name, the small restaurant has nothing to do with Australian food! 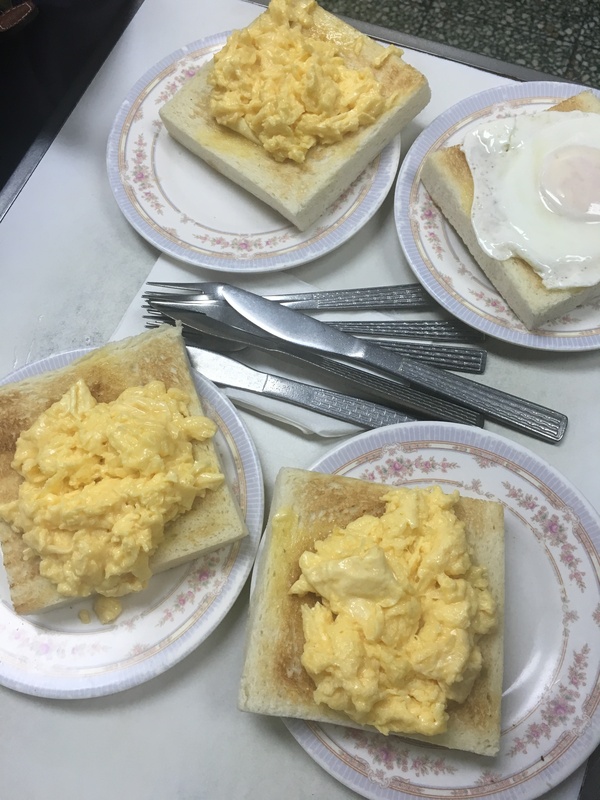 Yet, it serves traditional Hong Kong style breakfast. It is much talked about by food and travel bloggers, so we decided to give it a try. There was a queue of approximately 15 people when we got there, but the queue moved rather quickly. The restaurant is so small, so are their tables. We had to squeeze in a small table for 4. I pity my brother and R because they had to fit their long legs in such tiny table! The menu was all in Cantonese, but my initial research told me that the servers understand simple English and I also took note of the most commonly ordered menu: toast with egg and milk tea. And that’s what we ordered. The food came out quickly but as we were eating, we realised that everybody in our surroundings ate so quickly as well! It seemed like they were rushing. The servers also moved at high speed compared to usual servers in other restaurants, and somehow it made me feel pressured to finish my meal quickly… hahaha. Overall, I loved my breakfast but I don’t think the place is that special for me to come back. Afterwards, we went straight to Disneyland. We took the MTR and it took us around 45 minutes from Jordan MTR station to Sunny Bay station. I was excited all the way.. until we reached the destination and found out that it was raining heavily outside :(. At least I found Churros!!! But the show must go on, we came prepared with our rain coats and decided to go through. There were not many people in the park as the rain kept falling. Some rides were closed as well, it was not the ideal Disneyland moment and to be honest I was disappointed… hahaha. I told R, if I were a child, I’d probably cry already :p.
The rain finally stopped later in the afternoon so we had time to take pictures with some pretty lights, and because Disneyland Hong Kong is not that big, we finished exploring the park before sunset and then head back to the hotel. On the way, we stopped by a McDonalds which happened to be very interesting and had dinner there. I’ll share stories about this McDonalds in another post. Iyaa Adhya itu sedih siiihhh ujan deress hampir seharian penuh :(((( tapi tetep ujung2 nya dibawa happy, namanya juga lagi di Disneyland hehehe. Kita juga rada kaget pas liat antri, tapi berhubung udah jauh2 dateng jadi jalanin aja, itung2 nyobain hehe.. Btw kamu apa kabarnya? sehat selalu kan yaa Bumil.. belum sempet main ke blogmu niihh.. So unfortunate that it rained on the day you were in Disneyland 😦 . Looks like you had a lot of fun Christa! Too bad it was raining, I think I would be sulking if I were you lol. But Disneyland is the happiest place on earth right? So rain or shine it’s bound to cheer you up. I heard about this “Australia” breakfast place, it is quite popular amongst food bloggers, but seeing your review, there’s nothing I hate more than being rushed while eating ugh! I am not into any amusement park, Christa, but Disneyland with heavy rain like,,,em,,yes disappointment. I feel the disappointment. Hug.